AC Propulsion today announced it has signed a Letter of Intent with Peraves AG to bring the Progressive Automotive X PRIZE-winning E-Tracer to market in the United States. 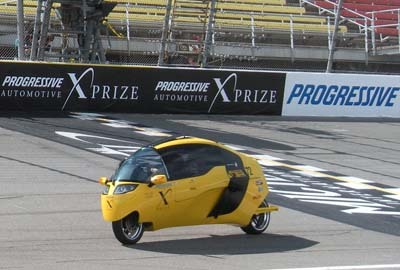 Two weeks ago, Peraves’ E-Tracer took top honors in the Alternative Class (Tandem) category at the X Prize awards ceremony. Peraves, whose E-Tracer is powered by AC Propulsion’s electric drive system, becomes the first X PRIZE winner to announce production. Although details of the collaboration are still in discussion, the Letter of Intent between the two companies signifies a positive step forward in bringing this electric vehicle to market. AC Propulsion and Peraves are making this announcement on the eve of AltCar Expo 2010, as this Southern California-based show provides both consumers and the industry with a glimpse of the latest alternative-fuel technology. AC Propulsion and Peraves plan to bring 100 units to market starting in 2011. The E-Tracer will be assembled at AC Propulsion in San Dimas, California. 21st Century Motoring will serve as Peraves’ North American agency and as a key player in the sales and marketing of the E-Tracer.